It was an amazing treat to have such a great view of the Doylestown Historical Society’s dedication ceremony of a historical marker at State and Main Street. The marker was set in place to honor The Lenape Native Americans important role in Doylestown’s history. Native Americans from the Delaware Valley and elsewhere were dressed in magnificent traditional costumes in vibrant bright colors that showed off beautifully in the afternoon sunlight. Many families lined the streets to enjoy the dedication that was highlighted with a spirited performance of traditional dance and music. The importance of our Native Americans’ history and current crcumstances has always been one of my great interests. While travelling in New Mexico we were fortunate to have the opportunity to visit reservations and view their rich heritage of hand-woven textiles and pottery. Nejad Gallery has also proudly supported the ANA Americans for Native Americans nonprofit organization that raises money for humanitarian efforts in the Southwest, started by the late attorney Bill Eastburn and his wife Connie. 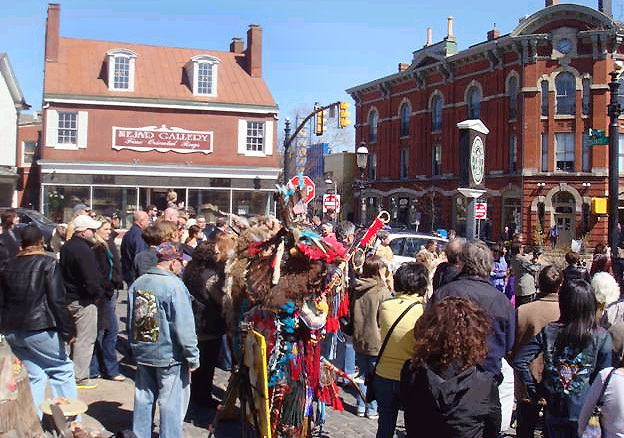 This entry was posted in Doylestown and tagged ANA Americans for Native Americans, dedication ceremony, Delaware Valley, Doylestown, Doylestown Historical Society, hand-woven textiles, humanitarian effort, Lenape Native Americans, Main and State Street, Marker Dedication Ceremony, Native American history, Nejad Gallery by Theresa Nejad. Bookmark the permalink.